Robie House was our main destination on Saturday, and like May House in Grand Rapids, which was built at the same time, it is an incredible piece of architecture, a work of art as well as a home. 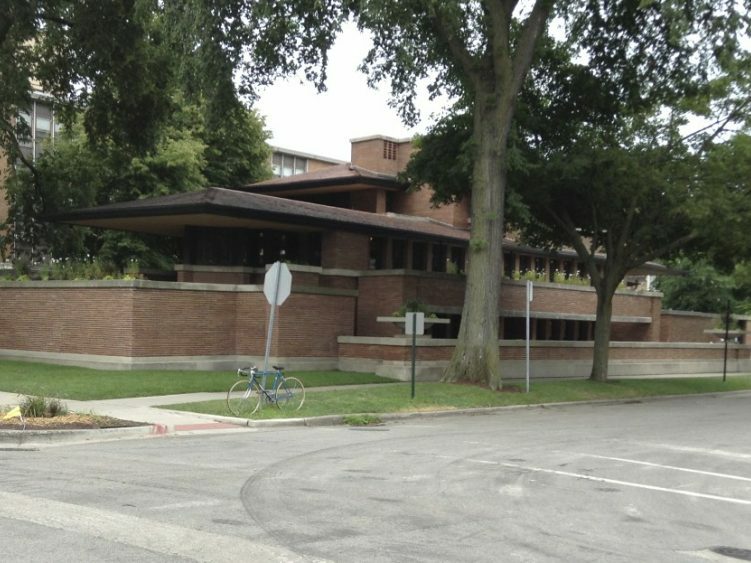 Twice it was threatened with demolition, and twice Frank Lloyd Wright came to defend it. It was the only one of his constructions he ever defended; as the last of his prairie-style homes, he saw it as the epitome of that particular style. The Wright Conservation Trust acquired access to the home in 1997, and even today, while the structure has been restored, unlike May House, there is still much work that needs to be done on the inside. I would like to come back if/when it is finished. We were suitably impressed with the skill required to make today’s Chicago what it is, from the smallest building to the Willis Tower. But the first part of my Bible reading this morning put it all in perspective. Mark 13:1-2 says, “And as he came out of the temple, one of his disciples said to him, ‘Look, Teacher, what wonderful stones and what wonderful buildings!’ And Jesus said to him, ‘Do you see these great buildings? There will not be left here one stone upon another that will not be thrown down.’” It reminded me that one day, all the great achievements of humanity will pass away.” In this chapter Jesus goes on to talk to his disciples about the end times. After describing some of the events that would come to pass, and the destruction of this world’s system, he says in verse 31, ”Heaven and earth will pass away, but my words will not pass away.“ This is near the end of Jesus’ earthly ministry and even though nearly 2000 years have passed since He spoke these words, his statement remains true. Nations and kingdoms have risen and fallen, and His words remain. As we rode into the city on the train, and as we drove around a small part of it today, we saw that there is also decay and ruin, and with it human sorrow and hopelessness. The Robie family only lived in their wonderful home for a year. Mr. Robie’s father died, and the son felt obligated to pay his father’s large debts. He sold the home to another family, and his wife left him when the money was gone. The next family also only lived in it for a year before the father died, and it was sold again. We tend to think of wealth and possessions as ensuring a safe comfortable life. But it is all illusion. Jesus said, ”Whoever saves his life will lose it, but whoever loses his life for my sake and the gospel’s, the same shall save it.“ The only true riches are those that are invested in His kingdom. As Jesus said, His words will not die, and one day His kingdom will cover the earth. The humble teacher from Galilee will rule and reign. We who are his disciples are already a part of that kingdom, and it is our responsibility as citizens of that kingdom to share the good news of the gospel, to do what we can to bring hope to those who have no hope, encouragement to those who sorrow, and to keep our eyes on the true kingdom that will never fall.